Bring the beauty of flowers right up to your door – or onto your deck or balcony. The Kensington Planter Box Trellis is a one piece planter box with a trellis that enables you to grow climbing flowers or vegetables. 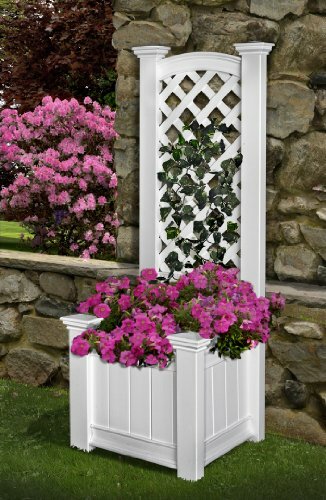 Our attractive design and attention to architectural details will make the Kensington Planter box trellis an attractive addition to your outdoor area. Our impeccable quality and 20 year warranty ensure that youll be able to enjoy your Kensington year after year. The Kensington planter box trellis is made out of vinyl and is maintenance free.